Dolans is officially Ireland's number 1 Live Music Venue: 3 venues, a restaurant and a bar which hosts a traditional Irish Music session every night. Dolans opened the same year as The Irish World Academy of Music & Dance at The University of Limerick. We have strong connections with the music students in the University. Bands such as Beoga, Four Winds, Goitse, Moxie and Liadan have played in the sessions, sometimes after playing gigs upstairs or in the Warehouse. Martin Hayes, Sharon Shannon, The Dunne Family, Karen Hickey, The Daly Family, The Lyons Family, The Clohessy Family, to mention a few, are all regular visitors to the Traditional Irish nights. Whether you are a top class musician or a total beginner, The Monday evening session from 7.30 - 9.15, could be the one for you. It is an open welcoming session, allowing musicians of all levels and ages to join in, sing a song, dance a step, part-take and to simply enjoy playing music, led by multi-award winning musician, Aisling Lyons. During the summer nights, let yourself be entertained in the very laid-back, warm & comfortable, candlelight setting of Dolan’s Bar with some old, and new, Irish ballads and stories brought to you by singers and musicians. With a vast range of musicians in the area, the content and variety of the sessions are subject to change from one night to the next. So join us at Dolan’s Bar Limerick, Monday to Sunday night, to sit back, have a drink and a few nibbles, relax and enjoy some of the finest musicians and entertainment Limerick city has to offer! 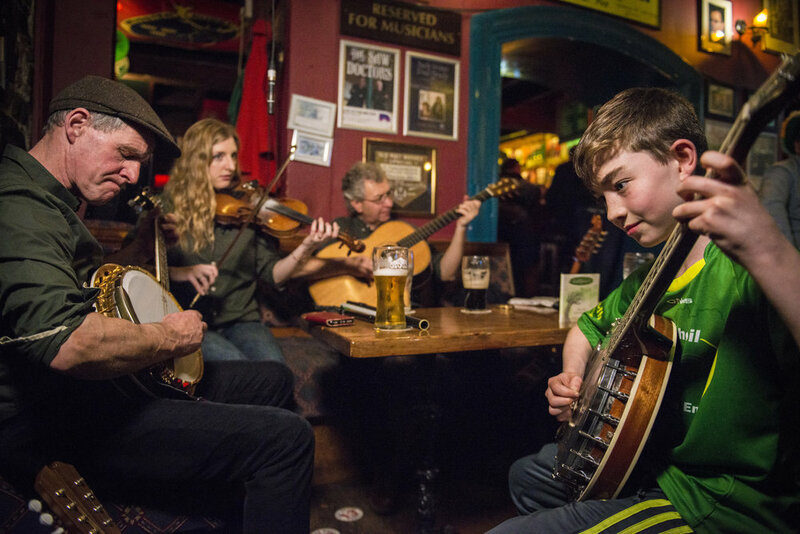 Traditional Irish Music in the Dolans music venues. Dolans also caters for group bookings where you are wined and dined while listing to live traditional Irish music, and later on everyone gets to try their hand at Irish Dancing.